The V.A.T. exercises in this course will develop all sections of your legs, creating shape, balance, size and cuts so necessary to win contests today. Leg development in bodybuilding separates the champions from the also rans. Superbly developed legs, both the thighs and calves, are rare indeed. Even at the national and international level, few men have legs that match their great upper bodies. On the average bodybuilder, the contrast between upper and lower body development is even more obvious. Often the legs look totally underdeveloped. This not only makes their physiques look unbalanced and incomplete, but top heavy and weak. But having good legs is the sign of a real athlete and an intelligent, hard-working bodybuilder. A great physique is not complete without complete leg development and having complete leg development plays a major role in winning physique contests. Yes, balanced physical proportions wins the top titles. Who knows how many bodybuilders have lost titles because their thighs and/or calves were not up to par. Admittedly, the legs are not as much fun to train as say the chest or arms and they do take more hard wto develop them than any other body part but still I find it strange that a lot of people neglect their legs and work only at developing an impressive upper body. Beginners especially are guilty of doing this, feeling that the upper body is more important than the lower body. But they are wrong. The whole body is important. No matter how great your upper body is, without balanced leg development, it means nothing! Always remember that symmetry is the key to success in bodybuilding. The calves count as much as the biceps or triceps and thighs count just as much as chests, delts or back. It’s not how developed one or two muscle groups are, but how well the total body is developed. Neglecting your legs has other repercussions, besides ruining your proportions. Because the legs are composed of the largest muscles in the body, the legs are the very foundation of your physique and the source of virtually all your strength as well. The stronger you get your legs, the stronger your overall body strength will increase as well. Also many bodybuilders don’t realize that working the legs hard and heavy is not only the best way to develop body power but the upper body cannot realize it’s full size potential unless the legs are proportionally developed. This means that neglecting your legs will hold back gains in your upper body as well, while training the legs produces gains all over your body. Because the legs are so big and strong, they need a lot of training with heavy weights and a variety of exercises from various angles to train them completely and the legs are just about impossible to overtrain. Early in my career, I too, made the mistake of neglecting my legs. Due to my genetics, I had naturally big legs. 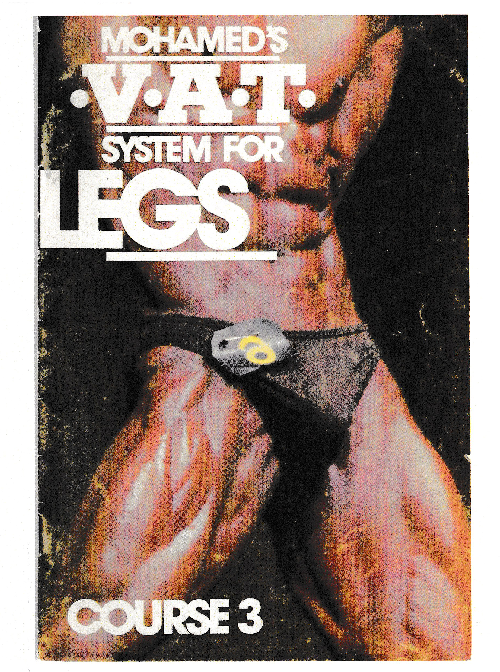 In the 1970’s no one was really concerned with thigh definition so I just went on training my legs haphazardly, doing very little thigh or calf work and scarcely giving them the attention I gave my upper body. So while my legs were big, they were not as cut, hard or muscular as my upper body. But in the back of my head I had this nagging fear that my legs were not in proper proportion or in harmony with my upper body development. I hated doing regular squats. Over 10 years ago I hurt my back doing squats and also I didn’t want do squats in the traditional way because I never wanted to grow muscles on my hips and glutes, giving a thick stocky look like weight-lifters, powerlifters and regular users of the squat. So I was searching for new and effective movements that didnot ruin your shape and get you wide at the midsection of the body. In Egypt, I never had access to good equipment for the legs like you do in North America so I was at a loss as to what to do instead of squats. Thus for years, my leg development stayed at a virtual standstill. This situation remained the same until I came under the influence of the “Iron Guru” Vince Gironda who became my trainer. Vince quickly remedied the situation by devising an outstanding long range leg routine that completely changed how my legs looked. For the first time, I learned how to train my legs properly. What had I been doing wrong? Like everyone else I had only been training my legs from just two sides, the front and back, but there are four sides to legs (front, back, inside thigh and outside thigh) and all must be trained properly if the legs are to take on impressive shape and development. Also for the first time I really started to train calves properly. The biggest enemy of calf development, is neglect. Tremendous thighs and poor calves won’t make it in contents either. Your calves and thighs must be at the same time in balance with each other and the rest of your body. Only then will your physique be close to the physical perfection we all strive for.